Alaska is a land of superlatives, full of incredible nature, and wide open spaces. It’s home to North America’s highest peaks, one-of-a-kind wildlife, and so much more. I’m of the mind that every American should make it a point to visit Alaska at least once in their life, but since the place is so big and there is so much to see, it can be challenging deciding on what places to visit in Alaska. Let’s put things in perspective, Alaska is HUGE. So huge in fact that you could fit California, Texas, and Montana inside. 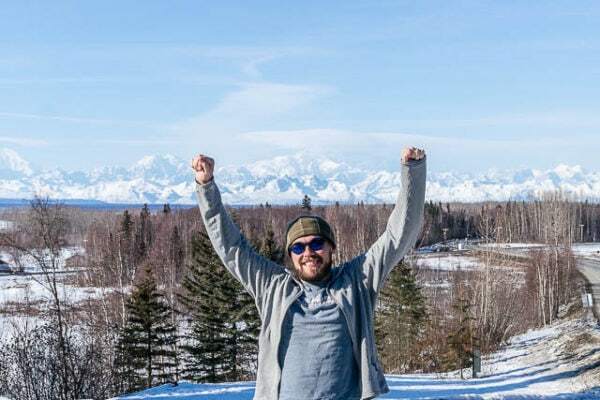 Don’t beat yourself up if you can’t see everything in a one or two-week trip, but rest assured that any trip to Alaska will undoubtedly blow you away and leave you wanting to come back for more. I know that’s been the case for me, for friends, and for family. 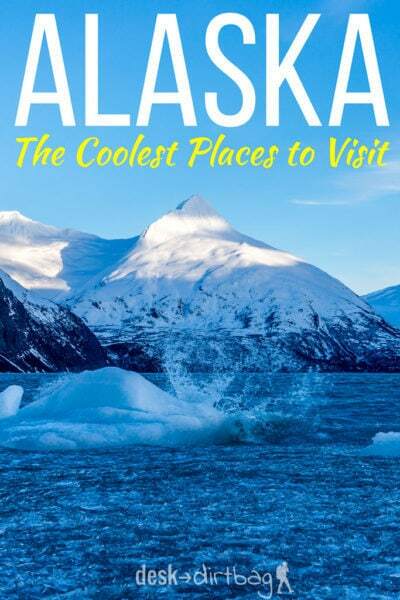 In any case, on to my top picks for the coolest places to visit in Alaska, some of which are remote and not easily accessible, some can be seen on an Alaska road trip, while others are best visited on an Alaska cruise. For most people flying to Alaska, Anchorage will be their point or arrival and departure. Anchorage is the largest city in Alaska, but at only around 400,000 people in the metropolitan area, it is still decidedly small. Although small compared to the Lower 48, Anchorage accounts for more than half of Alaska’s population, meaning that this is the center for things to do in Alaska. You’ll find incredible seafood restaurants, awesome microbreweries, museums, and a cool city surrounded by astounding nature. We absolutely loved our stay in Anchorage and almost considered changing our flight back to Seattle and staying longer in this cool town by trying to land a house sitting gig. Katmai National Park is located about 290 air miles southwest of Anchorage and is one of those places that is only accessible by small plane or boat. This region is rarely visited, but for the few hearty souls that make the trip, you will be rewarded with experiences you won’t soon forget. First and foremost is the fact that Katmai is one of the world’s best locations to see brown bears in the wild. More than 2,200 brown bears inhabit the park, and some locations, such as the popular Brooks Camp, allow visitors the chance to see bears congregating along the river to feast on sockeye salmon. Innumerable islands, rambling fjords, coastal mountains, and temperate forests are the main draw along this 500-mile long stretch of sparsely populated land that juts out from mainland Alaska toward Washington state. While locals may be travel by boat and plane, the vast majority of visitors will come to know the Inside Passage from the comfort of a luxurious cruise ship as they navigate the stunning waterways. Visiting Alaska by cruise ship is one of the most accessible ways to visit this otherwise hard to access corners of Alaska. Speaking of cruising the Inside Passage, the highlight for many week-long cruises is a visit to Glacier Bay National Park, where massive glaciers calve into the frigid waters where chunks of ice float past the boat. Glacier Bay National Park is also a UNESCO World Heritage Site and one bonus of sailing within a national park is that cruise lines are required to have a park ranger on board while within the park, giving visitors access to their wealth of knowledge with short lectures or informal talks. While I’ve not yet had the chance to take a cruise to Alaska, my dad, grandma, and extended family go on Alaska cruises almost every year (10+ times now!) because of how incredible it is. The more remote Hubbard Glacier sits further toward mainland Alaska and isn’t as frequently visited as Glacier Bay due to the added distance, but it is possible to find week-long cruises that will visit this impressive glacier. 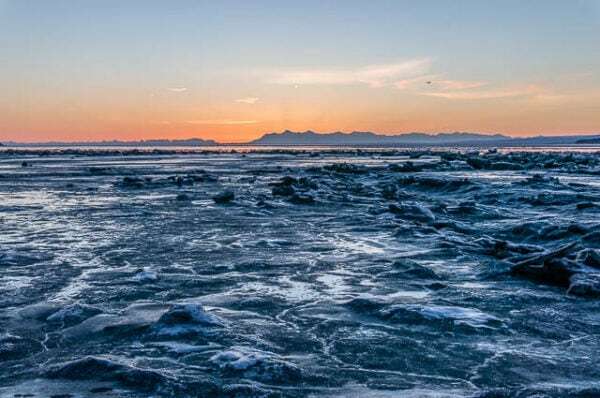 While Glacier Bay has numerous glaciers, the Hubbard is simply one mammoth glacier, the largest tidewater glacier in North America which is a staggering 76-miles long and 1,200 feet deep. If you are impressed by the biggest, then you can’t miss the Hubbard. Celebrity Cruises is one of the top choices if you want to visit the Hubbard Glacier. My family raved about the Hubbard, as well as how luxurious their experience was with Celebrity Cruises. Of the numerous stops while cruising the Inside Passage, the coolest town to visit along the route (according to my very experienced family) is the little town of Skagway at the northern end of the Inside Passage. This former gold rush town was once the largest city in Alaska, but still hangs on to a lot of its charm, whether you’re strolling the historic boardwalk, visiting the Klondike Gold Rush National Historic Park, or riding on the vintage locomotives that go past Chilkoot trail. If you can’t swing a week or longer to cruise Alaska, you’ve still got an excellent opportunity to get up close with Alaska’s incredible glaciers if you can make it to Seward, Alaska, a relatively short, 130-mile drive from Anchorage along some spectacular scenery. From here you can charter a day trip cruise to Kenai Fjords. Kenai Fjords may be the smallest of Alaska’s many national parks, but it still packs a big punch, where the wild landscape tumbles into the Gulf of Alaska, with hundreds of quiet bays and coves, and the impressive Harding Icefield which covers more than 700 square miles of ice up to one mile thick. While the summer months may be the best time to see Alaska from the sea, that doesn’t mean there aren’t things to see in Alaska during winter… The most incredible of those things is, undoubtedly, the Northern Lights. 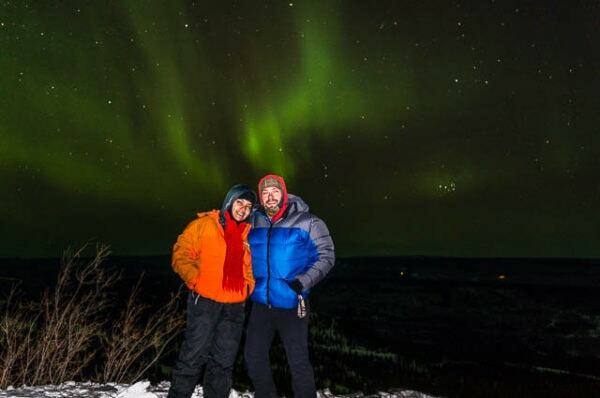 Luckily, Fairbanks is also one of the best places in the world to see the Northern Lights, offering lots of activity and the clear night skies conducive to seeing this spectacular phenomenon. Seeing the Northern Lights in Fairbanks was truly one of the most magical experiences I’ve ever had while traveling. Couple that with going dog sledding in Fairbanks, and you’ve got yourself a one-of-a-kind adventure in Alaska. 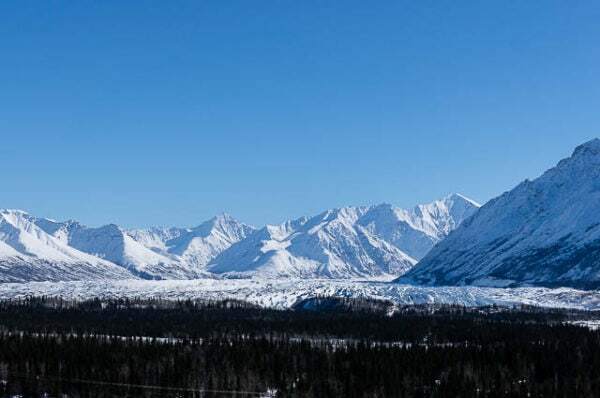 A short drive south of Fairbanks, you’ll find the tallest mountain in North America, the stunningly beautiful Denali. The mountain is the centerpiece of a six million acre reserve filled with taiga, tundra, glaciers, moose, caribou, bears, and so much more. The main point of access for the park is a 91-mile long road, although only the first fifteen miles are accessible by private vehicle, and to go beyond, you’ll need to hope onto the shuttle bus. We went during the tail end of winter and felt like we had the place to ourselves. The Dalton Highway is a 414-mile road that begins north of Fairbanks and ends at Deadhorse, Alaska near Prudhoe Bay. The highway is one of the most isolated roads in the United States and has only three towns along the entire route. 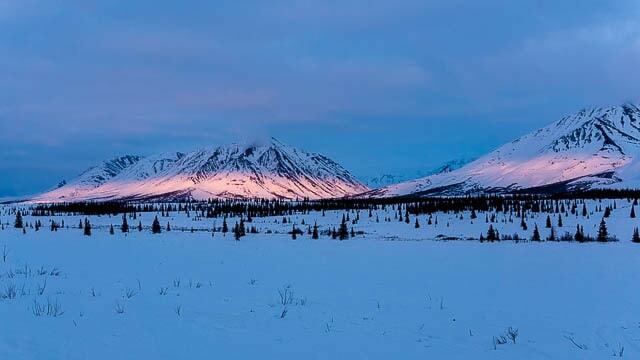 The mainly gravel road draws tourists who are primarily interested in crossing the Arctic Circle where you can experience those days where the sun doesn’t set. Talk about an epic road trip. Speaking of road trips, no Alaska road trip would be complete without a visit to the Matanuska Glacier, the largest glacier accessible by car in the United States. This long tongue of ice is 27 miles long and 4 miles wide and is only a few hours from Anchorage by car. Not only is the glacier incredible (and incredibly accessible), but it also sits along Alaska’s Highway 1, which I consider to be one of the most scenic drives in America (at least among those that I’ve personally driven). 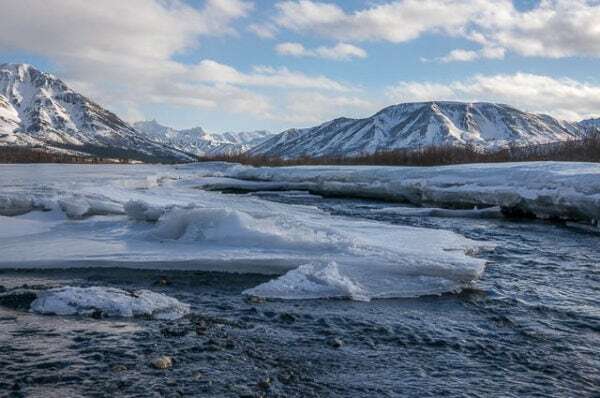 As you can see, Alaska offers up some absolutely astounding scenery, one of the most wild and impressive landscapes that is so easily available to travelers today. Honestly, I can’t recommend enough a trip to Alaska, whether you’re visiting Fairbanks in winter or cruising the Inside Passage in summer. Put Alaska at the top of your travel plans and make it happen. You won’t regret it. If you’re an experienced Alaska traveler, what else would you add to this list of the coolest places to visit in Alaska? Sound off in the comments below. Did you enjoy this article about the coolest place to visit in Alaska? Then please take a moment to share this on Facebook, Twitter, or Pinterest. Thanks!